Cosy chalet with free wifi. 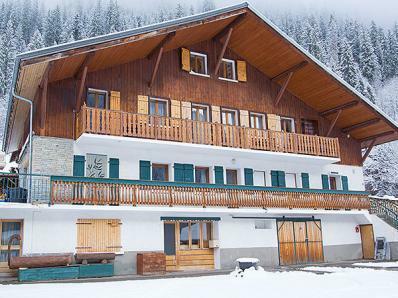 Excellent location close to the Linga cable car and several ski slopes, in the heart of the Portes du Soleil ski area. It is the best starting point to the perfectly linked ski mountains of Morzine-Avoriaz, Champéry and Les Crosets on the swiss side. The traditional mountain chalet offers a relaxed holiday flair due to the generous room layout. On the main floor, you find the spacious living area and friendly dining area for up to 16 people. Modern well equiped kitchen. The panoramic balcony offers view over the surrounding mountains. There are also 4 bedrooms with 2 single beds each and a 3 people bedroom with a double and a single bed. On the top level theer are a bedroom with 2 single beds and a bedroom with 3 single beds. Each of the 7 bedrooms dispose of its en-suite bathroom with toilet. An enclosed area in the lower part of the chalet is not accessible for the tenants. Distance to the next restaurants and shops about 200 m; to the lively village centre (bars, restaurants, shops, ice-rinks, new aquatic centre -wellness and fitness areas-, horse sleigh rides) about 2 km. 650 slopes, 211 ski-lifts. Altitude of the Chalet 1,250 m. New ski link in Châtel between Linga and Super-Châtel via two chairlifts and slopes. Châtel is located in the heart of the Franco-Swiss Portes du Soleil ski domain, between Lake Geneva and Mont Blanc, with marvellous slopes around Avoriaz, Les Lindarets and Les Crosets / Switzerland. Châtel-Linga is the best starting point to discover the whole area. Several slopes of different levels lead back to the chalet. This ski area has ski slopes for everybody (beginners as well as advanced skiers). Snowboarders enjoy the Smooth Park, Boardercross or the FFS-Halfpipe. In Châtel are a lot of other options for winter activities: e.g. snowshoes trails, ice diving and ice skating. We do not offer ski passes for the selected week.